nice one jonny boy. heading out finally next thurs fri..and the weekend. i need to shoot somthing. I was calm watching these deer for what seemed like an eternity. They fed down a hill toward me and honestly, I didn't think they'd come into range. Once they got into range, I wasn't excited until after the shot and when she flopped once she ran out of fluid. The other deer trotted off but just went back to feeding pretty quickly. can't wait to do it again, next time on a big buck! Nice Jon! Congrats brother. Happy to see you back out there! I was able to shoot 3 bucks so far this year, all with firearms. The first one was at the same exact location (Maryland) where I shot the doe, only a month later. Matter of fact, the buck came out at the same time and same place as they did that night in September. 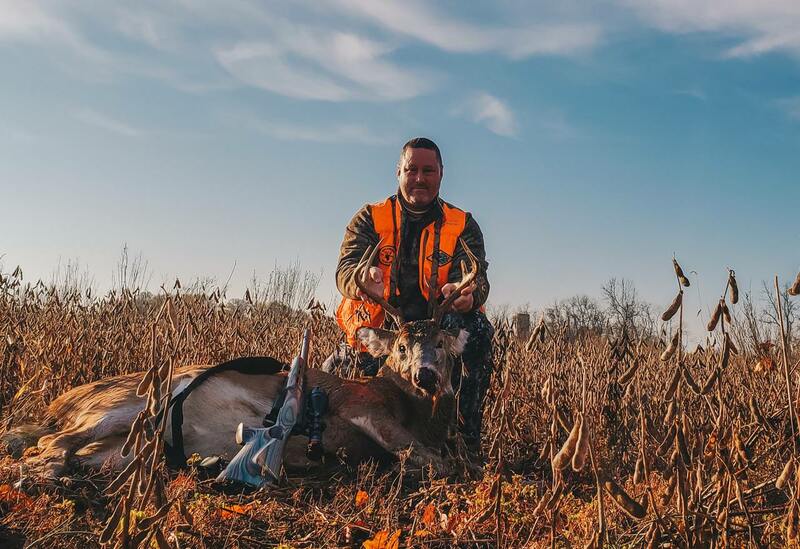 I had my muzzleloader and decided to take the buck. He's no trophy but it was an awesome hunt. 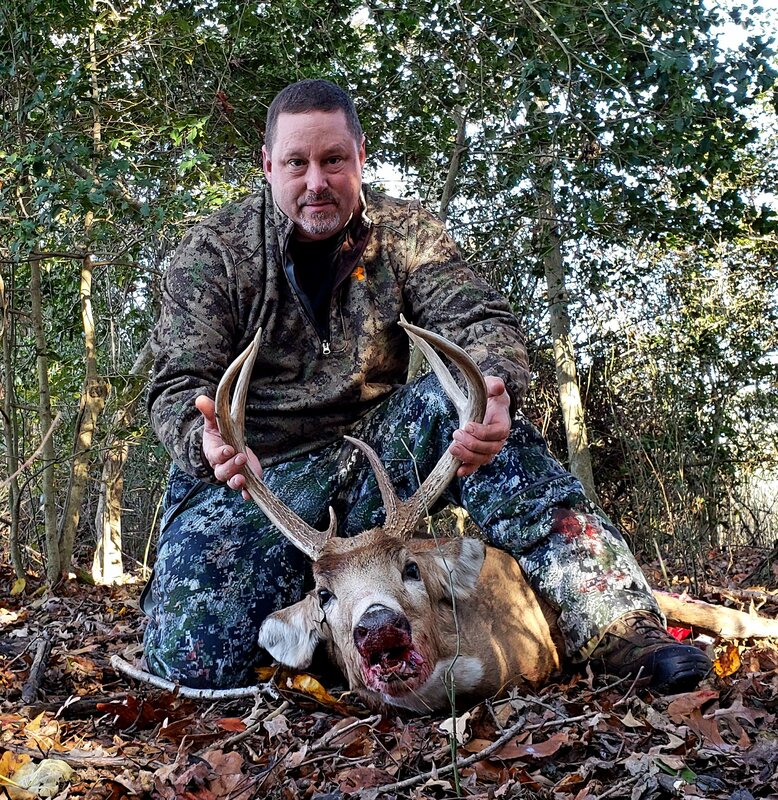 The next buck was during the rut and back in Delaware. The weather was windy but anything can happen during the rut and I wanted to be ready. I had setup in the morning overlooking the marsh but deer just weren't moving like they should be so I relocated to a spot that I could see both woods and fields since I thought the winds might keep them out of the marsh. My thoughts paid off and within 15 minutes of getting in my stand, had a buck chasing a hot doe with no cares in the world. Took him with my new Savage 220, tracking wasn't necessary. My third buck was back to the same farm I took the first doe and buck. Opening gun weekend just after the rut and was looking for a buck that might still be cruising. The first morning, I was greeted by hunters from the farm that butts up to ours coming in only 5 minutes before legal shooting light. One hunter setup on the treeline that is the border, talk about being a jacka$$. I didn't see a deer that whole morning and decided to let the woods rest for the afternoon and go back out the next morning. When I setup the next morning, I was pleased to see that there were no hunters on the farm next door. I was able to see a buck at first light with a doe way out in the field. Does kept piling out of the woods to feed in the beans as well. About an hour after first light, the same buck I saw early came back across the field in the opposite direction, this time he was at 180yds but was moving too fast. I sat thinking that he might come back and he did. This time, he was going back the other way again but this time he was moving slow and only 100yds out. I put the scope on his shoulder and down he went. If I was faster, I might have been able to pop the doe he was with too! I still have one more buck tag in Delaware and several doe tags so I'll continue to hunt but probably on the nicer days! No real need to sit in the rain anymore. This year wasn't about the trophy bucks, it was mostly focused on perfect shots where I didn't have to track. Mission complete. How do you like the thumbhole stock so far? Thanks Swampy. I have a thing for a thumbhole stock, makes the gun feel more stable for me. I use Boyds for most of my guns, they make a great drop in stock. Damned good season for you, Jon. I haven't even seen 3 deer yet, let alone bagged them. And...that looks like the same Boyd's stock (their "Featherweight Thumbhole") that I have on my Savage 111. I agree, it's a very comfortable and easy-to-hold-steady stock. Yep DP, same same. I have the same one on my muzzleloader and H&R shotgun, had the same one on my 300Win Mag. Love em! That's some great work my friend! You my have my permission to stop for this season. You've done quite enough unless of course you donate the venison in which case you should keep on keepin on. In picture #2 you have the face of a mass murderer. What were you thinking? 3rd buck/3rd pic Is that a box blind in the background? Did you shoot that one with the same Savage slug gun? When are you coming back to Virginia? I have only had one thumbhole, a Boyd's on a Knight muzzzleloader that would shoot "lights-out"--- if it weren't at the bottom of the river because of a tragic canoe accident. I found the thumbhole a bit awkward to do any spot-and-stalk or sneaking with, but it's probably something you'd get used to in time. Thumbholes do feel good on the bench or from the shoulder. You are right about the stability, I think. If I knew a long gun were going to be used mostly on the move, though, I'd choose a traditional stock in a do-over.